NBC Olympics selects SES for 4K satellite distribution at Winter Games. 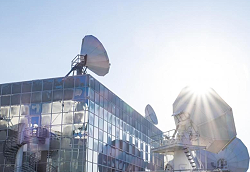 Stamford, Connecticut, February 2018: NBC Olympics, a division of the NBC Sports Group, selected SES to provide 4K High Dynamic Range (HDR) satellite distribution for its production of the XXIII Olympic Winter Games, which take place in PyeongChang, South Korea, from February 8 - February 25. The announcement was made by David Mazza CTO & SVP, NBC Olympics, and Steve Corda, Vice President, North America Media Platform, SES.